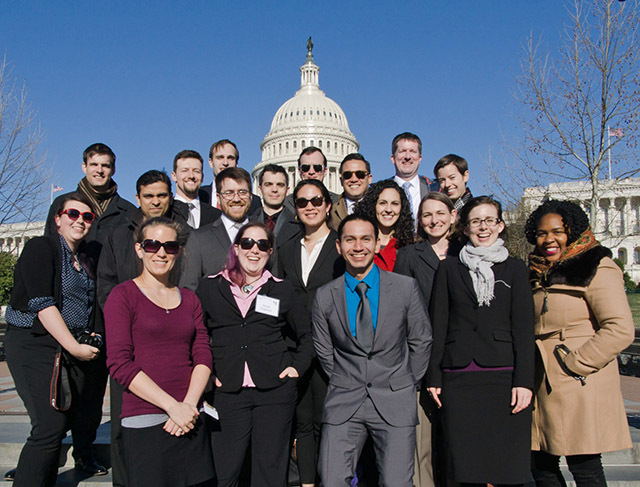 Every year the AAS brings volunteers to Washington, DC, to advocate for federal support of their science with their members of Congress for a Congressional Visits Day (CVD). You must be an AAS member. You must be eligible to vote in the United States. The AAS will cover the majority of travel expenses for volunteers selected to participate, as our budget allows. Submitting the form does not guarantee you a slot in this year's CVD. Selected volunteers will be notified by mid-February 2019. Schedule: This year the AAS CVD will be held Monday - Wednesday, 11 - 13 March 2019. One or two pre-visit webinars (one hour or less) will be scheduled in the weeks ahead of the visits. Tuesday, 12 March: REQUIRED all-day seminar on how to communicate effectively with policy makers, including some information on the issues that currently impact astronomy and science in general, approximately 8:00 am - 6:00 pm. Wednesday, 13 March: REQUIRED full day of meetings on Capitol Hill with congressional staffers. Volunteer Selection: We aim to select approximately 15 volunteers who balance the program by location, career stage, and experience. We especially encourage graduate students and early-career professionals to volunteer. We generally ask that people who have done training and Congressional visits for astronomy advocacy before — through programs like AAS CVD, AAAS CASE, facility/collaboration programs, etc. — not volunteer for CVD, as we intend this program to increase the number of astronomers empowered to advocate for science. Travel Support: AAS has sufficient funds to reimburse most travel expenses related to the AAS CVD, including lodging, transportation, and meals. Selected volunteers should plan to arrive in Washington on Monday, 11 March (or Sunday evening, if necessary), and depart Wednesday evening, 13 March (or Thursday morning, if necessary). AAS will book hotel rooms, and volunteers are asked to consider sharing rooms to reduce cost and maximize our volunteer capacity. Volunteers will generally need to pay initially for their transportation and some meals, and then will be reimbursed by AAS after CVD, though we will try to work with anyone who would have trouble paying upfront for large costs. How to Sign Up: Please use our CVD 2019 Sign-Up Form. You’ll need to sign in to the website using your AAS username and password to submit the form. The deadline for application to AAS CVD 2019 is 11:59 pm on Friday, 25 January. Selected volunteers will be notified mid-February 2019. CVD 2017 participants after their day of Hill visits. Front row: Gail Zasowski, Nicole Gugliucci, Jesse Rivera, Heather Bloemhard, Jedidah Isler; middle row: Maya Yanez, Karna Desai, James Davenport, Melodie Kao, Vivienne Baldassare, Katie Devine; back row: J. Adam Hughes, Sam Schonfeld, Mitch Ambrose, Ben Elwood, Tom Beatty, Josh Shiode, Joel Parriott, Julie Davis. Courtesy Jesse Rivera. The links below [for members only] will take you to pages with instructions for volunteers related to each aspect of the event.